I met Heather online through her blog and from the very first moment her beautiful baby girl stole my heart. She of the huge eyes and wide smile. The laughs Heather and I shared over Maddie and Peyton was the beginning of a special friendship. My heart shatters into a million pieces to know that the world has lost Madeline Alice Spohr. The world is an emptier place for it. If you’d like to honor this beautiful child, please donate through Heather’s site to the March of Dimes. All my prayers and love to Heather and Mike Spohr. 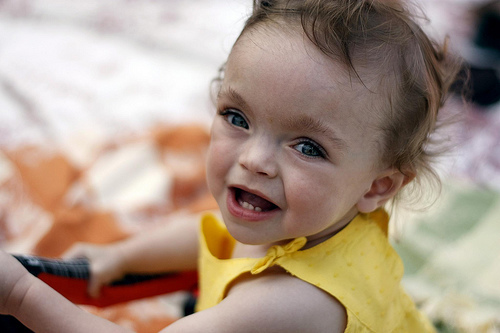 Looking at that beautiful baby’s photos and reading her story is also breaking my heart. The world is so unfair sometimes. Anissa my heart is breaking. It’s breaking. How did this happen? It doesn’t seem real. I just can’t believe that beautiful little girl is no longer with us. I’m still in shock from reading it yesterday, my heart is aching so badly for them. Caseys last blog post..quick sewing project. It is unbelievable. I cannot imagine. Kylas last blog post..It’s nothing…and that’s okay. A million pieces, my heart is in a million pieces for them. Their website is overwhelmed, so I have added a link on my page. I hope it’s okay that I borrow your picture of Maddie. I am pointing readers to BHJ’s page for donations. Gah I really can’t type sometimes ……. a girl form Austin you’ve never met……. Oh, this breaks my heart! I used to read Mike’s blog (when he blogged) and always used to comment about how adorable Maddie was and her eyes… oh my gosh those eyes. I found their blog through your site which I have been reading for a while. I was captivated by Maddie’s adorable eyes. I just found out about the news tonight and it is very sad and heartbreaking. Life is not fair. I am still so sad when I think of Maddie’s passing. I am so glad Heather has such great friends to help raise awareness for March of Dimes.